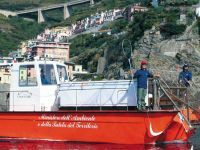 The Cinque Terre Marine Protected Area has been having an ecological boat at its disposal since 2004 to free the area from pollution: the orange Ecological Boat called "spazzamare" (sea-sweeper) is a versatile and fast boat, developed and planned as means for the integrated safeguard of the sea and of its resources. 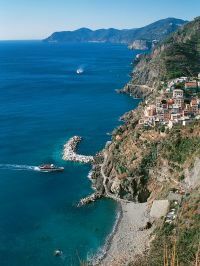 It is used for the implementation of the environmental safeguard service of the Cinque Terre Marine Protected Area, aimed at the conservation and safeguard of the ecological and environmental features of the related coastal marine area. The service is provided by the qualified staff of the MPA that has been properly trained (two people of the crew go aboard the boat), and it is structured through interventions aimed at collecting the solid-floating and beached material, at monitoring the marine coastal area, at giving information at the seaside, at preventing the violation of the environmental laws, at supporting the rescue activity at the sea, at maintaining the works at the sea the MPA is in charge of. In the respect of the main safeguard regulations, the means to free the area from pollution periodically patrol the MPA and take the polluting material away without annoying the users and bathers or putting at risk their safety. During the operations for the collecting of the solid floating material, the operational approach provides the immediate identification of the material in the removal phase, the insertion of the material onboard, the transport of the material to a specific equipped locality, the disembarkation of the material at a specialized company, and finally the proper disposal in the respect of the regulations in force. The boats of the MPA, such as the ecological boat, are used for the monitoring of the environmental ecological conditions (marine-coaastal monitoring), in order to prevent possible environmental violations, discharges, waste abandonment, etc. 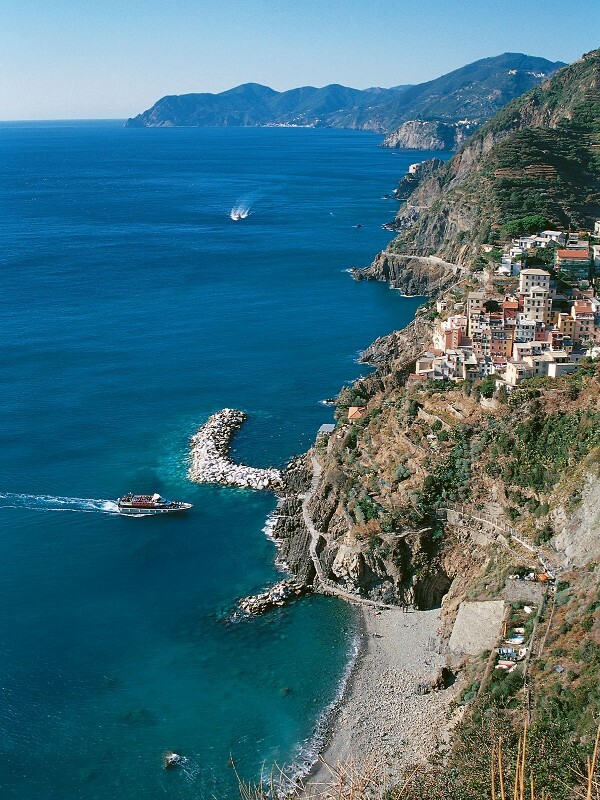 The service is provided in agreement with the maritime authority in charge (Harbour master's office of La Spezia), with full transparency and with the collaboration of both the residents and the casual users. 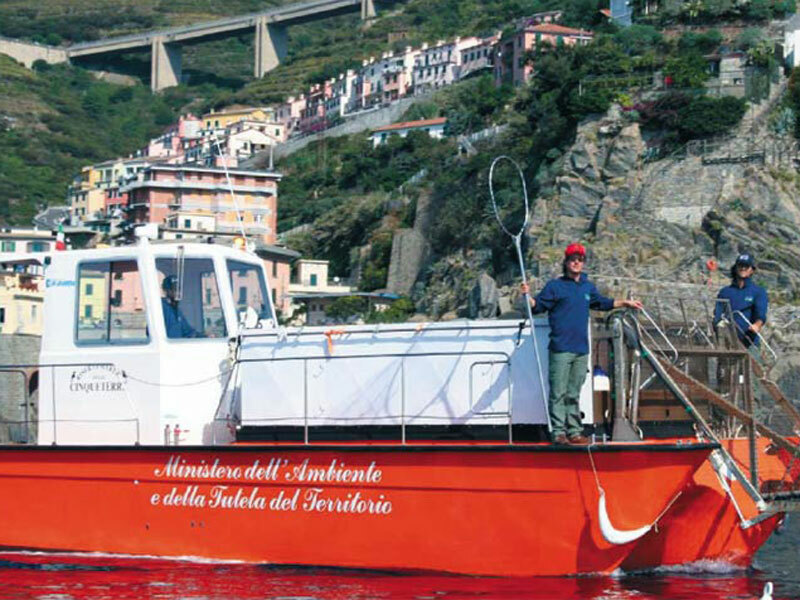 The ecological sea-sweeper boat is therefore used during the patrolling activities and for the environmental protection along specific and planned routes (taking into consideration the superficial currents, the materials' tendency to move and the accumulation areas found during the previous monitoring activities); the MPA has activated a phone number for the possible warnings given by casual users, residents and authorities in charge of the control and the safeguard (harbor master's office of La Spezia, Carabinieri, State Police, State Forestry Corps, Castalia Ecolmar, ecologist associations, etc. ): depending on the service needs, the crew of the unit in charge of freeing the area from pollution is available at the number +39 3475780004, published on the web portal of the Park and of the Marine Protected Area. This tool, besides performing the above mentioned function, is also used for other related purposes, such as the ordinary maintenance of the MPA's sea facilities, and in ecological-environmental projects. Furthermore, the crew contributed to create an information service at the sea in compliance with the new Organization and Implementation Regulation of the MPA through the giving out of information material. All the liquids produced by the boat (bilge grey water) and the waste deriving from possible manufacturing onboard are disposed of by suitable specialized and certified companies; the documents proving the disembarkations are at the units captains' disposal.